Did you know… After planting an asparagus patch, it can take up to three years for the plants to get established to the point where you can actually yield enough good-sized asparagus spears for a meal? That explains the $4-$5 price per pound a good part of the year. Thankfully, decent asparagus is available most of the year. However, at that price, my husband and I only purchase it for special occasions. The price drops in the spring so when I found it for a mere $1.77 per pound recently I had to start getting creative. 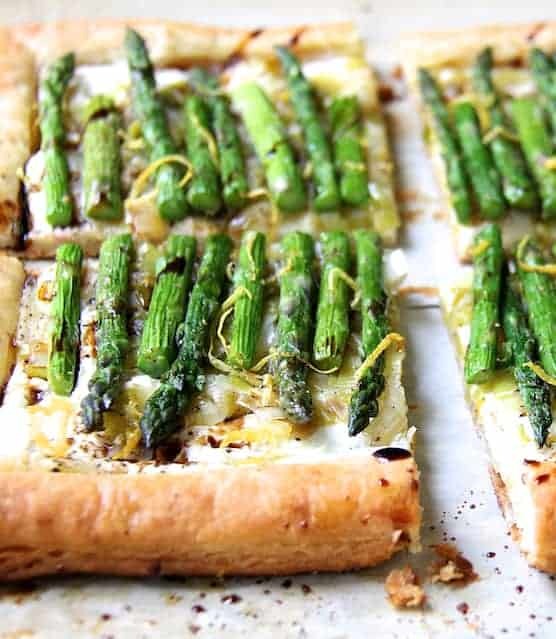 This easy, savory Asparagus, Spring Onion and Fontina Tart won’t have you waiting long to enjoy a fresh, springtime supper. Along with good asparagus, spring onions are also showing up in markets everywhere. They’re sold in bunches and have a more pronounced bulb than scallions; some of the green top and root end are still attached. For this tart, I just get the onions good and soft–not caramelized as they’re already wonderfully sweet. To keep them from browning, I add small amounts of water as they’re cooking. Make sure all the water has evaporated before placing them on the tart. Puff pastry consists of numerous layers of flour and butter or another fat such as shortening. When baked, the layers “puff up,” creating a light, flaky pastry. While puff pastry is entirely doable from scratch, it’s time-consuming and has to be kept very cold in the process. I’ve made it from scratch and you don’t want to go there if you don’t have to. Good-quality frozen puff pastry sheets are available in the frozen dessert section of most supermarkets. 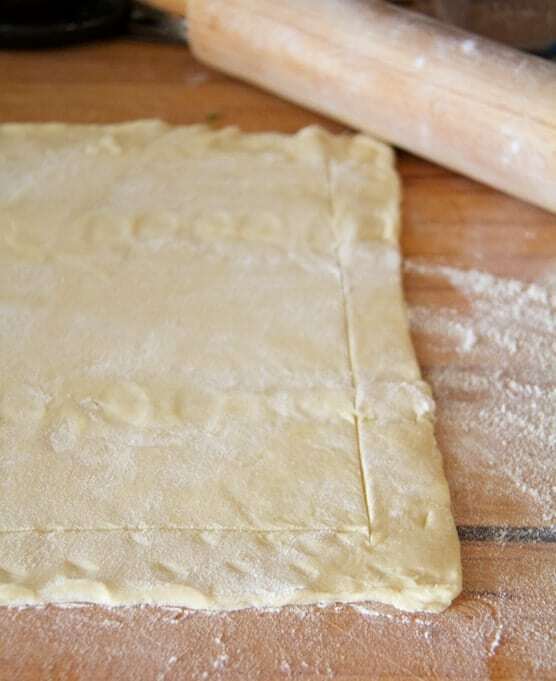 To make the puff pastry sheet into a crust, unfold and place on a lightly floured surface. Roll gently with a rolling pin to press and correct the folds. Score the pastry one inch from the edge on all four sides with a good sharp knife, being careful to not cut all the way through. After scoring the pastry, gently dock inside the scored area with a fork. In other words, poke it with a fork in several places. When you bake the crust before topping, the outside, undocked area of the crust will rise and remain so after cooling while the inside docked area will sink a bit, creating a perfect bed for the filling. To finish the tart, add some lemon zest and a drizzle of a good quality balsamic vinegar. Cut into quarters and serve hot or warm. Heat butter and oil over medium-high heat. Add onions, reduce heat to low and cook 12-15 minutes or until very soft but not browned. Add water as necessary to prevent browning. (Be sure all water has evaporated before placing on tart.) Season onions with salt and black pepper. While the onions are cooking, bring a small saucepan of salted water to a boil. Prepare an ice bath. Cook the asparagus very briefly (10 seconds or until bright green). Immediately immerse in ice water. Drain and blot dry with paper towels. On a lightly floured surface, roll out pastry to smooth and correct the folds. Score the pastry all the way around about 1-inch from the edge being careful to not cut all the way through. Dock the interior in several places with a fork. (Do not dock outside of the scored area.) Place on a piece of parchment paper. Bake for 12-13 minutes or until lightly browned. Allow to cool at least 10 minutes. Spread shredded cheese over the interior of the crust. Top with onions then asparagus, pressing asparagus down gently into the cheese and onions. Return to oven, bake 12-14 minutes or until crust is golden and cheese has melted. To serve, sprinkle with lemon zest and drizzle with balsamic vinegar. Cut into quarters. This looks so delicious! And so perfect for spring!! I will definitely have to try making a grain-free version for myself to enjoy!! 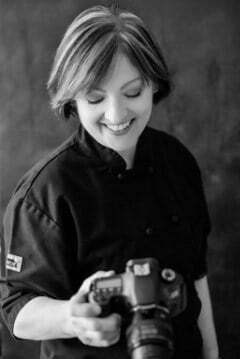 Thank you for this beautiful blog post!! This tart looks gorgeous, Carol! Great job! Gonna try to make it this spring. It doesn’t take three years to grow *each* asparagus spear. It takes around three years for asparagus plants, after being planted, to begin to make usable spears. After that, if carefully tended, the plants will produce spears for years and years and years. I could definitely sink my teeth into this. It’s a perfect spring recipe. I just learned this about asparagus! Definitely makes it easier to savor them. I never knew it took three years for asparagus to grow! Next time I have some, I definitely will appreciate it more. Delicious tart too – perfect for Spring!